The Weather Guy: Titans WIN!! The Tennessee Titans ran their record to 8-0 this afternoon in Nashville as they defeated the Green Bay Packers 19-16 in overtime. 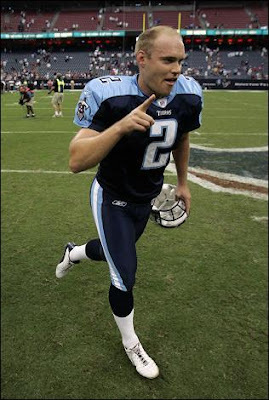 Rob Bironas, Titan's placekicker, made a 41 yard field goal to win the game. Earlier, with 4 seconds in regulation, he his attempt struck the upright. Bironas made field goals of 31, 25, 22, and 41 yards! WAY TO GO ROB...redemption is fantastic. The new version of 'Thunder and Lightning' with Lendale White and Chris Johnson worked well today as the tandem had 77 and 89 yards rushing respectively. Johnson also led the team in receptions today with six catches for 72 yards. The rookie, a first round pick from East Carolina, is playing extremely well. Some fans questioned the Titans organization for picking him, however, I am sure those fans have eaten their words! Kerry Collins was a respectable 18 for 37 for 180 yards and NO interceptions. The Titans took care of the ball. Collins was sacked twice by the strong Packer defense. Titan wide receiver Brandon Jones had several timely receptions for first downs. Another fantastic day for our Tennessee Titans. Clearly, they ARE the NFL's best team.